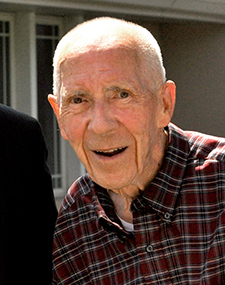 Buehler became a student at USU in 1937 and graduated with a bachelor’s degree in accounting. While at USU he met, then married MaRee Clawson. A career in the military took Buehler through 1969, when he retired as a colonel in the United States Army. He returned to USU’s College of Business now as a CPA, carrying a Harvard MBA and a doctorate in economics from George Washington University. He returned with a determined vision to shape the future of Aggie life. For the next 21 years as a management professor, Buehler shared, inspired and facilitated the goal of life-long learning in countless students and staff, building the internationally recognized Partners in Business program from the ground up and welcoming many of the world’s great thinkers to Utah State as a result, his award citation continued. After his retirement at age 70, and a year as caregiver to his wife while she battled progressively debilitating Parkinson’s Disease during the last year of her life, Buehler’s resolve to be of service to his fellow men was reinforced. He became a determined volunteer and philanthropist. “From 1980 to 2006, the generous gifts of Vern’s heart, hands and mind were further magnified through his significant volunteer service at Sunshine Terrace, where he worked seven years as president of The Sunshine Terrace Foundation and where The MaRee Clawson Buehler and Vernon Maughan Buehler Terrace Grove Assisted Living Center now honors his devotion,” the Spirit of Old Main Award citation reads. Buehler’s generosity at USU and in the community is inspiring. He funded endowments in the Partners in Business program, scholarship endowments in the College of Business and was a leading influence in the creation of USU’s Veterans Memorial and the Russell Maughan aviation memorial outside the Dee Glen Smith Spectrum. The Vernon M. Buehler Professorship in the College of Business further cements his pioneering legacy on the college and on the university he continues to shape. “In celebration of his distinguished life, tireless service, visionary philanthropy and abundant influence on Utah State University and the world, tonight we honor a soldier, an academician and a generous heart by proudly bestowing The Spirit of Old Main Award for lifetime achievement on Vern Buehler,” his citation concluded.